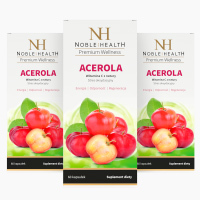 Acerola - Natural dermocosmetics and dietary supplements. Collagen creams. 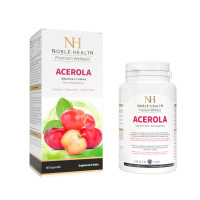 Acerola is a food supplement that has been designed for people who want to protect themselves from oxidative stress, take care of the proper functioning of their immune system or to maintain good psychological functions. helps regenerate the reduced form of vitamin E, protects cells against oxidative stress, increases iron assimilation to maintain proper energy metabolism. supports the proper functioning of an immune system and lowers the feeling of fatigue. supports the functioning of a nervous system and proper psychological functions. stimulates collagen production to maintain good functioning of skin, blood vessels, bones, cartilages, gums, and teeth. Counter oxidative stress with natural vitamin C! Supplement your everyday diet with carefully selected vitamins that support the proper functioning of your body. 1. Who should take Acerola? 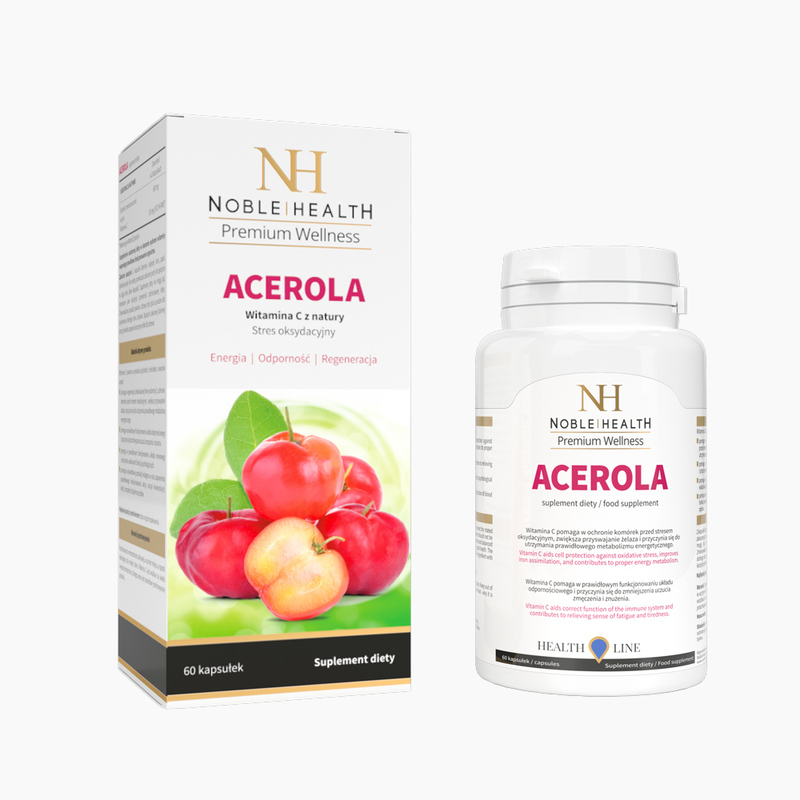 Acerola is a food supplement designed for people who want to protect themselves from oxidative stress, to take care of the proper functioning of their immune system or to maintain good psychological functions. 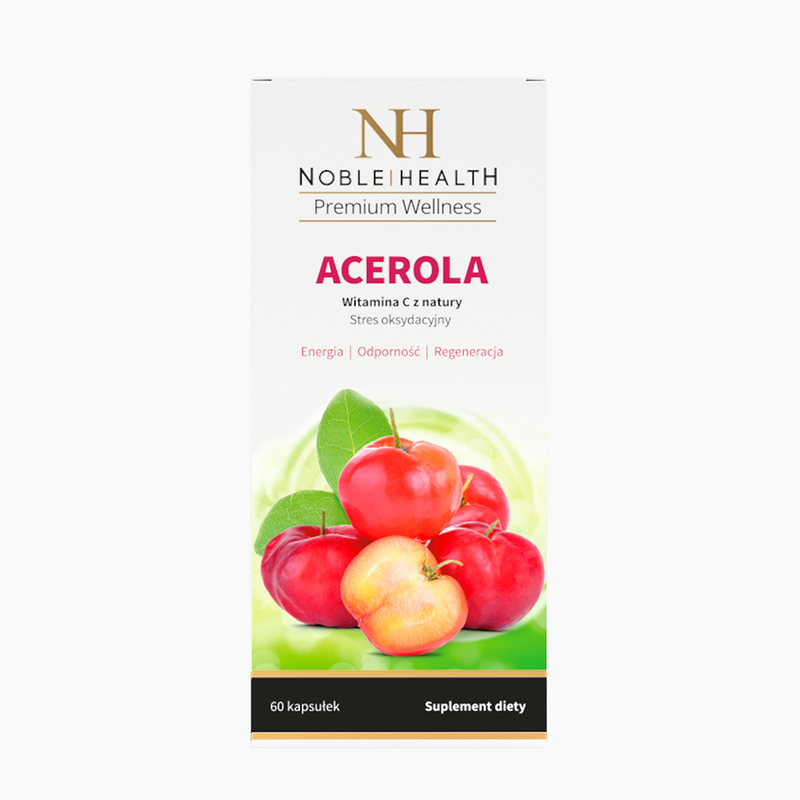 Ingredients: acerola fruit extract (Malpighia glabra), glazing agent - hydroxypropyl methylcellulose, colourant - titanium dioxide. 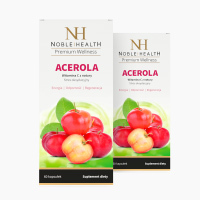 The product contains acerola fruit extract. 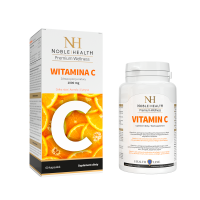 The vitamin C helps to regenerate the reduced form of vitamin E, protects cells from oxidative stress, improves iron assimilation and contributes to maintaining proper energy metabolism. In addition, it supports the proper functioning of the immune system and reduces the feeling of fatigue. Vitamin C stimulates collagen production, which is responsible for the proper functioning of the skin, blood vessels, bones, cartilage, gums and teeth, and helps maintain proper functioning of the nervous system and good psychological functions. Take 2 capsules per day, preferably in the morning. Wash them down with a glass of water. Do not exceed the recommended daily intake (two capsules). Food supplements cannot be used as a substitute for a varied diet. A balanced diet and a healthy lifestyle are essential for maintaining good health. The recommended daily intake provides beneficial health results. Store the product at room temperature in a dry place. Keep away from small children. 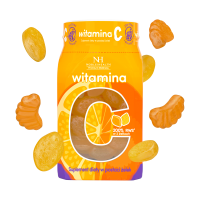 Vitamin C is sensitive to light and high temperatures, that is why it is important to properly store the product. 6. 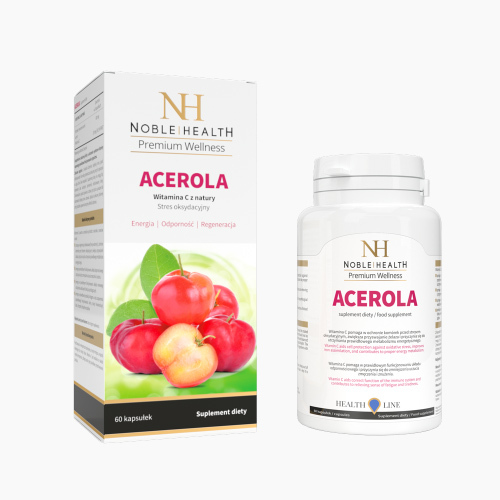 How many capsules are there in one Acerola? 8. Can I take the product during pregnancy or breastfeeding? Pregnancy is a special time and taking any food supplements should be consulted with your physician. 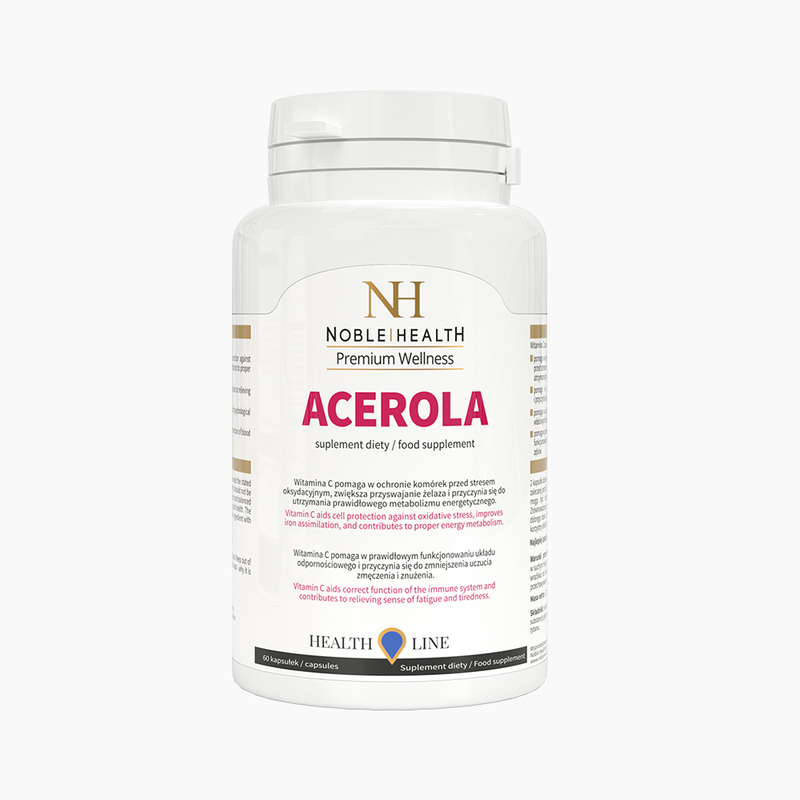 Noble Health products can be taken after the 6th month of breastfeeding. If you want to start supplementation in advance, consult your doctor.